How many times have you heard the word “interlock” in a software company? The concept is simple, but few know what it is and even fewer know how to launch products interlocked across the entire company. Yet, it is probably one of the most important processes you can master, especially for early stage companies. The concept of interlock is simple: you launch your product or service only after your entire company—from campaign to cash and everything in between, including go-to-market, sell, deliver, implement, support and manage revenue—is ready, and interlocked, in support of the business objectives. This sounds easy, but it requires strong leadership and discipline to implement. Those that do, are more assured of market success of their products since the entire company was enabled and ready to support their customers, from sales to go-live and beyond. Those who do not implement this strategy are at higher risk of post-sale failure, channel conflict, unfulfilled orders, failed or poor quality implementations, low adoption rates by customers, post go-live defects and unmet requirements, to name a few. You may survive perhaps one or two premature, non-interlocked product launches, but only if you’re lucky—and many are not. In most technology driven companies, the launch date is driven by the product or service delivery schedule, with enough marketing and sales readiness to generate and meet initial demand. Rarely is equal attention given to the readiness and enablement of professional services, technical support, order-to-cash or other post sale or back office functions to successfully fulfill that demand. This results in a quality drop of implementation, delivery, fulfillment, and customer service. These important, but post-launch functions, struggle to support the launched products before they are truly enabled to succeed. The cause is simple yet common: the lack of awareness, enablement and certification of professional service, customer support and partners to successfully implement and support the new product. Enterprise software companies are notorious for premature launch of products after much hype. The fulfillment is far below expectations due to poor quality and lack of knowledgeable professional services to implement the new release. For companies that rely on partners and indirect channels, only the best companies have strong partner programs that generate awareness, provide training for enablement and, where necessary, certification to ensure that each partner is successful selling, positioning, implementing and supporting the vendor’s products. Failure to do so will inevitably result in unhappy customers and negative hit to the brand. How Do You Implement Interlock? 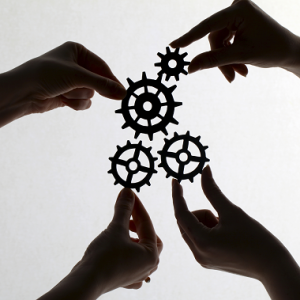 Implementing interlock requires vision, leadership and discipline across the entire company. In software companies, the product lifecycle should embody the concepts necessary to implement cross company readiness for new product launches. The core concept of the interlocked product lifecycle is to ensure that all functions of the company are on track to launch, market, sell, implement and support the product from concept to delivery. If any key functions, such as professional services or customer support, are not ready for the launch (untrained, understaffed, etc. ), the interlocked product lifecycle indicates this and the executive team has the opportunity to delay the launch until they are ready. Product management leaders are usually those that have the vision, the leadership skills and the authority to develop new products with collaboration from the entire executive team. 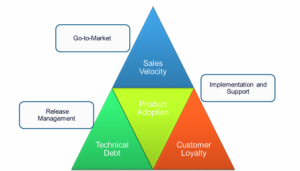 They also define, develop and implement the interlocked product lifecycle. In addition, collaboration with post launch teams such as professional services, customer support, order management, provisioning (for SAAS services) and finance (for revenue management) is critical. The product lifecycle should define the roles, responsibilities, deliverables and, most importantly, entry and exit criteria of each phase the product lifecycle to ensure that every function in the company is successfully tracking along the lifecycle and that no one falls too far behind. Consider this lifecycle: inception, elaboration, construction, transition, launch. Does it look familiar? It should. The first four are part of the Unified Process, and the launch is added to complete the cycle. Starting with inception, the executive management team identifies new markets with business objectives for the product management team to develop new offerings. The product management team develops new offerings and products, pricing and supporting constructs for review and approval. R&D performs initial sizing and technical feasibility. Marketing and sales would draft initial demand gen and sales plans, including market and territory analysis and on down the line through professional services, customer support, finance, legal, SAAS operations, etc. The inception phase would only complete when every relevant function has successfully completed their entry and exit criteria with approvals. In elaboration, every function focuses on expanding requirements (product management), technical designs (R&D), test plans (QA), infrastructure planning (operations), and initial demand generation planning (marketing). Only when the defined exit criteria, which are also the entry criteria for the construction phase, are completed, reviewed and approved by all relevant functions, does the company move onto to construction. The same interlocked, company wide progression continues through every phase; construction (development and testing), transition (packaging) and launch with the same discipline and focus on readiness. If any function is not ready, the product lifecycle should be put on hold to ensure that no one function, whether it is product management, marketing or sales, is too far ahead causing a non-interlocked product launch. Are there exceptions to the strict definition of the interlocked approach? Of course. There are many definitions and views of relevant functions, roles, responsibilities and entry/exit criteria. Product lifecycle interlock is flexible, it’s entirely up to your organization to decide how much rigor to put into the process. In established, competitive markets where failed products could have devastating effects, you want a more disciplined approach to protect your brand and market share while optimizing for success of the new offering. In new or emerging markets, you definitely need flexibility and agility. The benefits are the ability to iterate and pivot quickly to market feedback, while still having enough interlock to successfully support your products even as you prepare for the next iteration. As the saying goes, you are only as strong as your weakest link, and implementing interlock through a well-defined product lifecycle right-sized for your company’s profile and culture, will help ensure all your functions are strong and ready to support that all important product launch. Safe Harbor Statement: The views expressed on this blog, Product Management 2.0, are my own and do not necessarily reflect the views of Oracle.